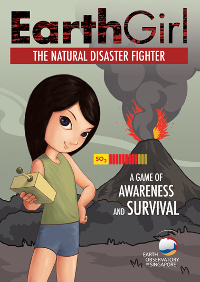 Earth Girl is a casual game about a smart and action-loving Southeast Asian girl who can save her family and friends from natural hazards. Earth Girl also fights to preserve the balance between human communities and nature. The game is currently available in four languages: English, Indonesian, Japanese and Chinese. Flooding – the player must jump on the platforms (up and down) to reach the people who need help. After that s/he must bring them to a safe place. When a player finishes the board they must answer questions. Increasing the awareness of natural disasters in the region: tsunami, flooding and volcanic eruptions. Interesting way to teach children compassion, willingness to help and community with other people. It is suitable for younger children. The game shows close communal relationships between the villagers from the poorer countries, which may not be so common in highly urbanized countries. computer with web connection and Flash 7 or above.